Another Alan Lomax recording from 1960. Raw, simple harmonies, with that wonderful downhome “quartet” sound. No over production here; this is good old unadulterated gospel at its best. Quartet singing dates back to before the turn of the century, and some of the earliest recorded music features quartets. Early quartet music was most often performed “a capella”. As quartet singing developed and grew in popularity in the late 1940’s-50’s, groups began adding light instrumentation, often a single guitar. The emphasis however, was always on the voices. The earlier “Jubilee” style, typified by The Golden Gate Quartet, usually featured ensemble harmony singing or a single lead singer over a group backing, often in a call and response pattern. 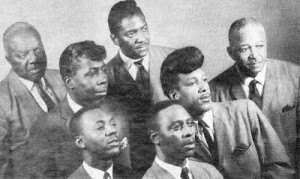 In the late 40’s and early 50’s a “harder” type of quartet style emerged, utilizing multiple lead singers within a song and with a generally more emotionally charged background. The term quartet, as used here, does not always strictly refer to a group of four. While many quartets were literal quartets, the term became used to describe the style of small group singing, rather than the actual number of singers. I especially love that big perfect pompadour!!! Sure brings back memories, RL! This blog is sooo cool. Thank you for doing all of this. Amazing!